Golden Jewellers in association with Zee TV Africa is proud to present Sunidhi Chauhan live in concert on the 22nd of April at the Durban ICC and 23rd April at Carnival City in Johannesburg South Africa. 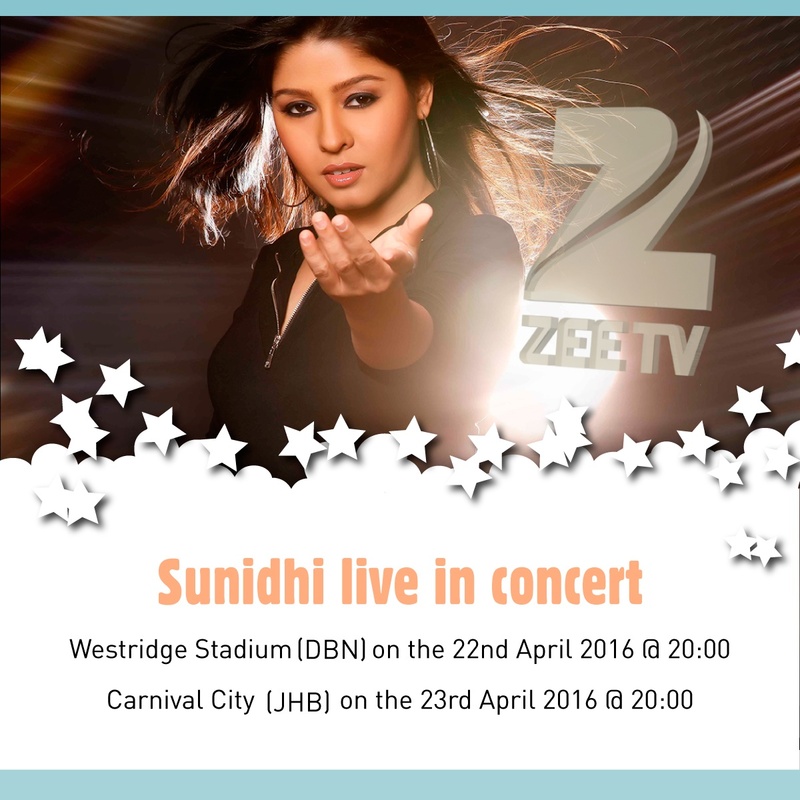 Sunidhi Chauhan is gracing the South African stage after many years. This event is bound to give her fans a show to write home about! Sunidhi has established a thriving career with Zee TV, being a judge on two very popular music talent shows, ‘The Voice India’ and ‘Sa Re Ga Ma Pa’. Born in Delhi, this playback singer began her career at the age of 13 with the movie, Shastra, and since then she has been mesmerizing audiences all over the world with her funky and fresh sounds. Zee TV Africa is honoured to be a part of this headline concert and looks forward to Sunidhi bringing the house down in Africa once again with songs like, Mehboob Mere, Dhoom Machele and Beedi to name a few. “Zee TV Africa is excited to host our Sa Re Ga Ma Pa and The Voice judge on our home ground, we are anticipating an evening to remember” – said Zee TV Africa CEO, Harish Goyal.